Whether you’ve lost a single tooth or need full dentures, dental implants may be your best bet for restoring your teeth. Implants permanently anchor artificial teeth into your jaw while preserving your facial structure, making it easier to speak and chew, and looking and feeling natural. Dental implants are replacements for your tooth roots that are made of titanium, an inert metal that bonds with your bone and isn’t rejected by your body. After the titanium is implanted, the metal infuses with your bone in a process called "osseointegration." Once that process is complete, the rods cannot be removed. According to dentalimplants.com, the success of dental implants is higher than that of any other implanted surgical device. Dental implants can replace a single tooth, to keep adjacent teeth from falling into the vacant space, or anchor bridges or full dentures. In the last case, the implants – usually three or four – are spaced around the jaw and the dentures are fitted onto them. Although they are attached to your mouth, they can be removed for cleaning. They’re more secure than regular dentures and allow for more normal chewing, eating and speaking and eliminate the sores and discomfort regular dentures can sometimes cause. What is the procedure for inserting implants? The dentist first examines you, with X-rays, to make sure you’re a candidate and to determine if your existing bone can support the implant. It is possible to restore bone with grafting, and, if needed, that will be done before the implant posts are inserted. (Bone deteriorates after tooth loss – making it important to replace the tooth as soon as possible.) The posts – roots – are fitted into the optimum spaces in your jawbone and allowed to heal for up to six months. It is during this time that the implant fuses with the bone tissue. Then the artificial tooth or denture is placed onto the implant post or posts. For dentures, this step may take a couple of months until the artificial teeth fit perfectly. You will receive care instructions when your treatment is completed. Good oral hygiene and eating habits along with regular dental visits will help prolong the life of your new implant. The good news is that if your implant is damaged, the crown can be removed and replaced without affecting the implant itself. Can everyone get dental implants? Nearly everyone can. Rarely, a medical condition will prevent the implant from fusing with the bone. Your dentist can determine if implants will work for you. Why are dental implants a good idea over other procedures or no procedure? Implants make your crown, bridge or denture more secure. As a single tooth, they can keep the adjacent teeth from falling into the empty space. They also preserve the adjacent teeth – unlike a bridge, which requires those teeth be altered to serve as anchors. Implants can restore or enhance appearance by creating the proper support for your facial muscles and contours. If a tooth is missing, an implant can restore your confident smile. An implant can prevent bite problems and jaw pain that can result if a missing tooth is not replaced. 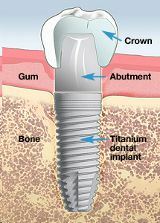 For more information on implants, call our office for an evaluation. Remember: Sooner is better if you need implants.